The grieving process can be greatly aided by actively preserving memories of your loved companion. Preparing these items can help distract you and keep you busy during your mourning period. The items will then exist as a memorial to your pet and a comfort to you. 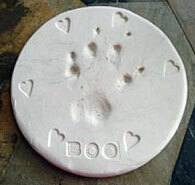 An impression of your cat's pawprint can easily be made with the following methods. These prints can be made at any time. Many vets are willing to do footprint impressions, too. 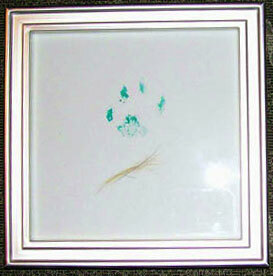 Purchase a commercial paw print kit such as ClayPaws for everything you need. Pet stores and hobby shops often carry these kits, too. Target sometimes carries hand/footprint kits in the baby department. If you have a comment or a related link to list here, please email the webmaster.